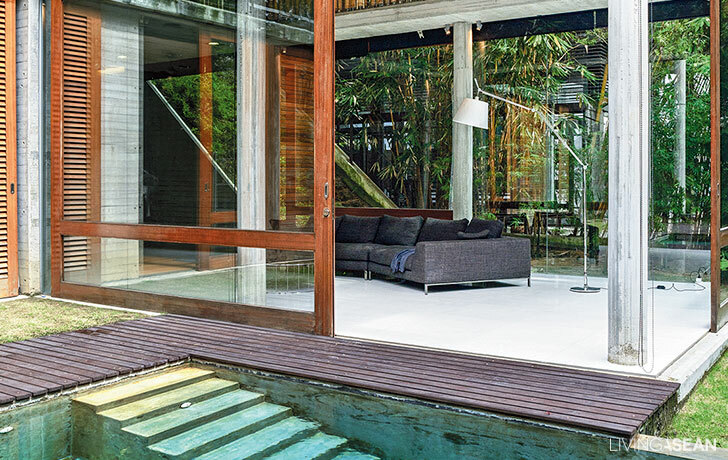 With bamboo as its main material, the architect has integrated the modern tropical design to the nature. 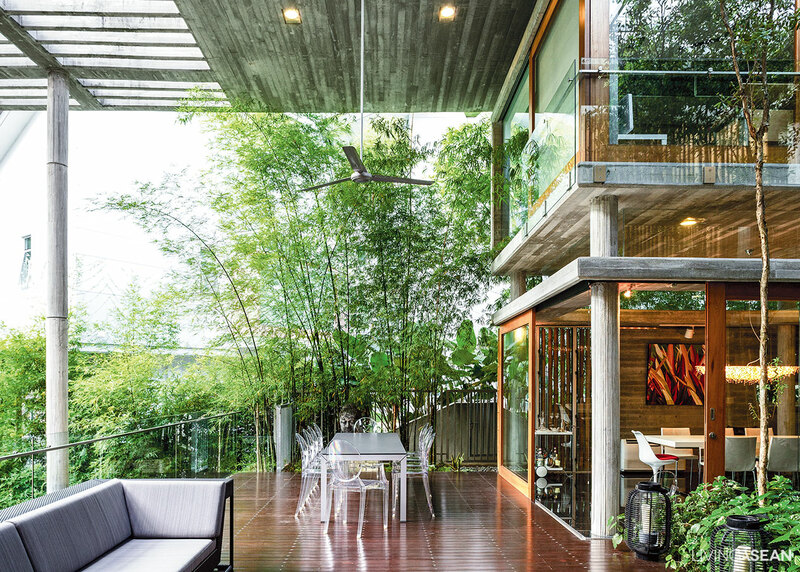 A concrete roof spanning 15 meters across provides protection for the sitting room, dining room, and bedrooms. 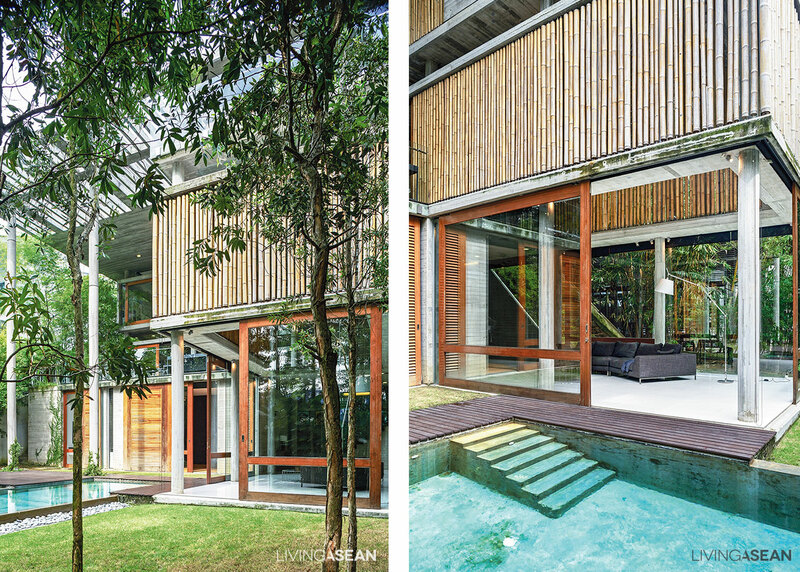 The swimming pool and terraces lie at the low end of sloping ground surrounded by full-grown trees. /// The door is especially made to open wide from one end to the other. So, the view is not blocked. Fung Kai Jin, the homeowner gave Bulcock freedom to design. The only request was to feature bamboo into the work, although the material has some flaws of its own. “Bamboo is a gift from nature,” said Fung. The sitting room has high ceilings. The upstairs TV room is protected from the sunlight by a bamboo lattice. Spaces between the walls promote good air circulation. Bullock then decided the house has to be an integrated one. 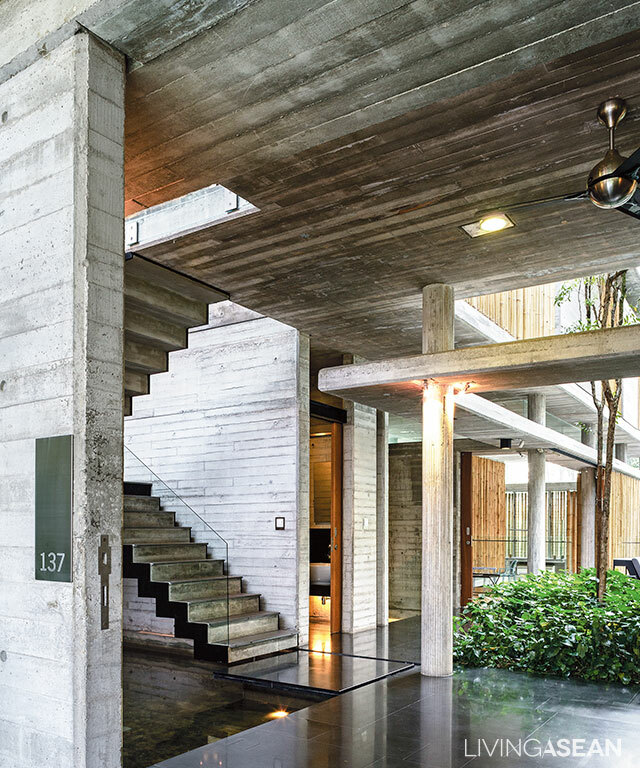 “The main idea is to make the house an integral part of the nature, he recalled. 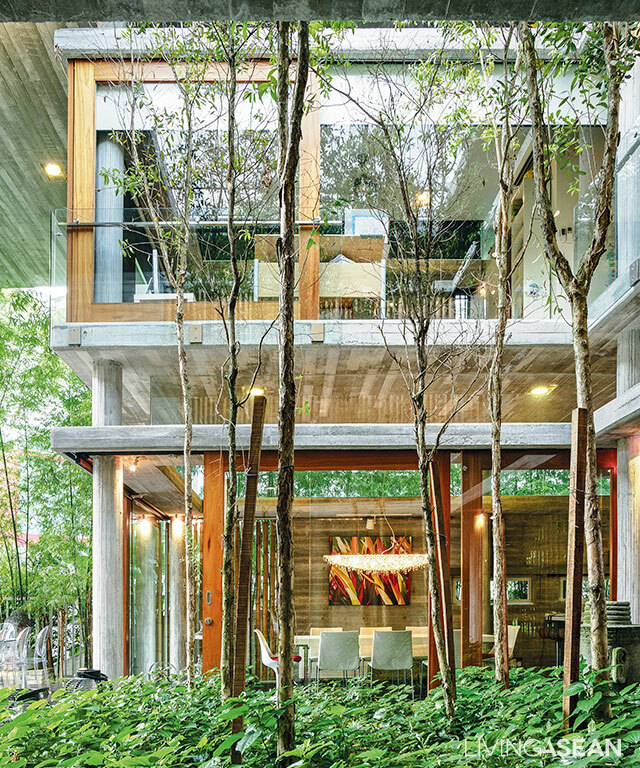 Imitating nature with a rain garden, the architects put in a nice little green alfresco oasis on the second floor. A semi-outdoors area stays cool and comfortable all day thanks to leafy plants and underground vapors. The three-storey house was set on a slope. So, Bullock placed a carport and a main entrance on the second floor for a practical use. The floor consists of a dining room, a kitchen, a TV room and a wide balcony overlooking a swimming pool. The lower floor includes a home office, a living room, a storage room and a maid’s quarter. Private area is reserved on the third floor. The bedroom is adorned with simple decoration. Plain concrete walls and white ceilings spice up the atmosphere. The floorboard is made of a hard wood for durability and a stress-free environment. 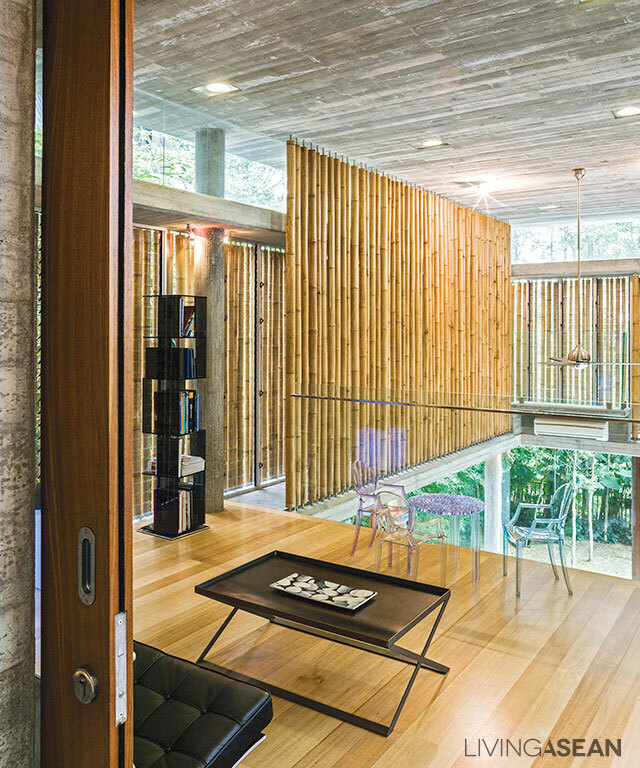 The house is kept small and uncluttered by dividing into rooms connecting through a roofed hallway that spans over 15 meters across the area. A small interval between the roof and the building is allowed for the rain and sunshine in. There are also gaps between the main roof and nearby rooms to promote a good ventilation system. 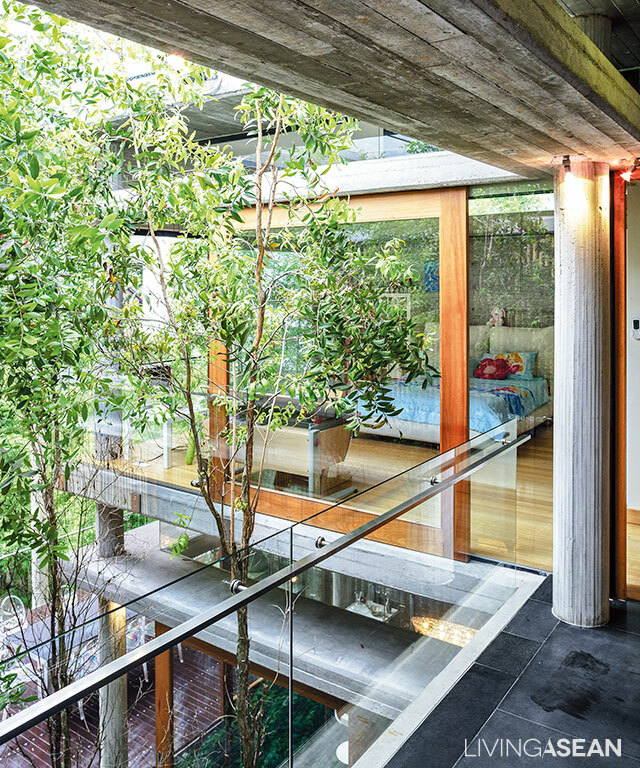 Fresh air circulates throughout the day through passageway and gaps in bamboo lattice. Courtesy to the tropical weather, there is no need for an air-conditioning machine. 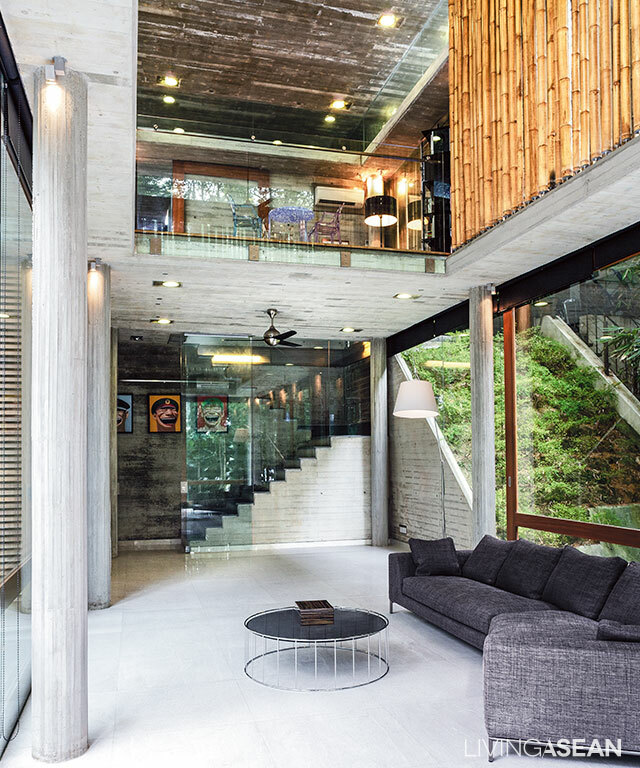 The architects install bamboo lattice in the interiors as well to create visual continuity. 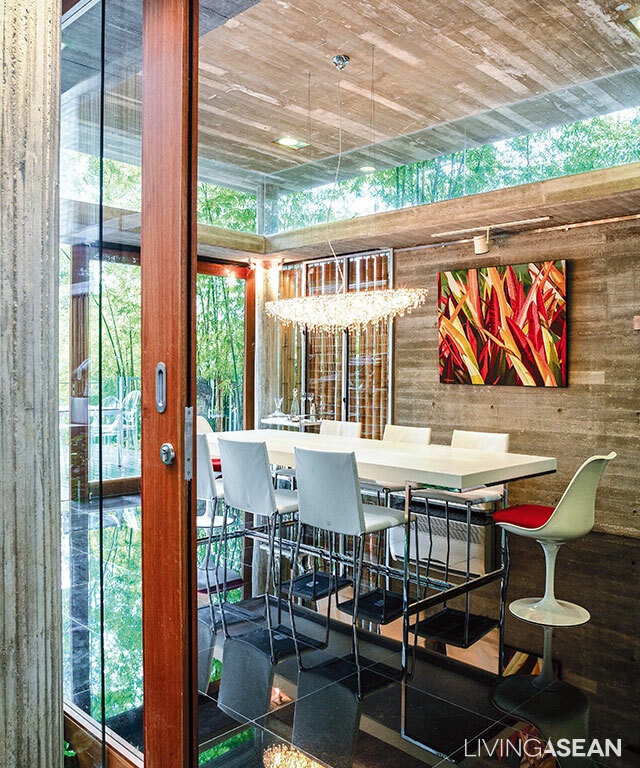 Fixed windows at the top edge of dining room walls allow light to shine through, while effectively keeping the heat out. 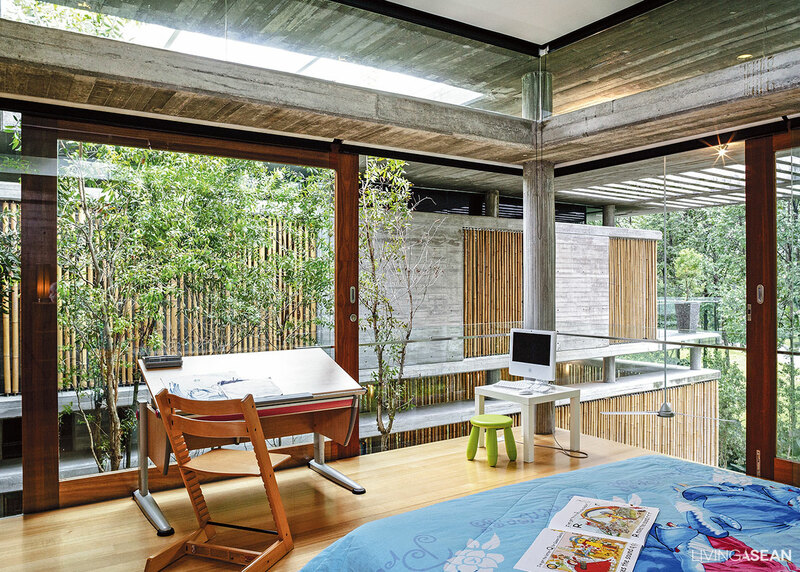 Large windows in the son’s bedroom make the interior very light and airy. The swimming pool below can be seen in full view from here. 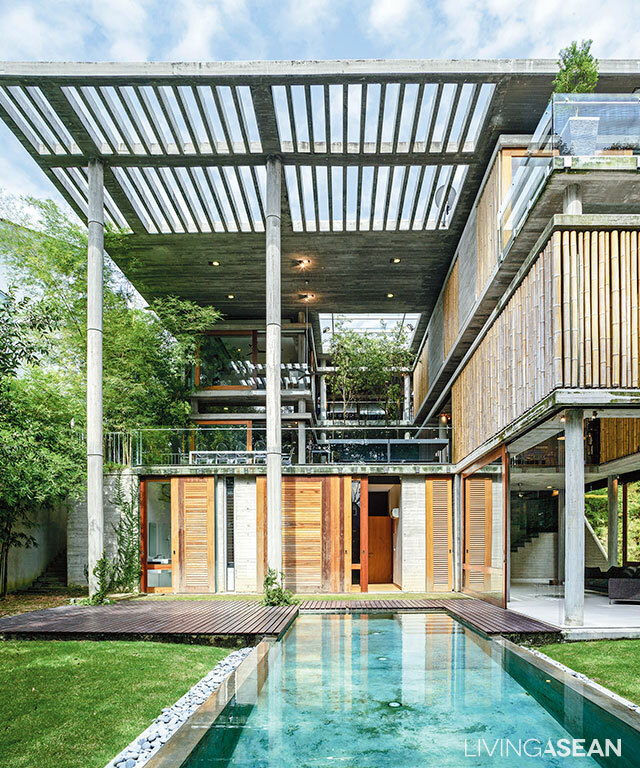 All things considered, this modern tropical house is a good example of what living close to nature should look like. For maximum exposure to the natural surroundings, stair railings are crafted of glass panels.